Here are some pictures from a typical afternoon at our house. Cheese Puff happily jumping in his doorway jumper... for about 5 minutes. Usually, his big brothers jump around him. But not when I break out the camera. Oh well. What will they do for the camera? Pose with yogurt. I think he would make a great spokesperson, even with his latest haircut by mommy. I got some advice from actual beauticians, and it's better. I'll figure it out at some point, hopefully before time for senior pictures. So, this was funny. Little Elvis accidentally colored on his pants at school. He decided to take them off when he got home. In our house, if Little Elvis does something, so does Baby Plum. Baby Plum took off his pants, and put on a new pair. Only he put them on backwards. He was rolling a car around on all fours with what looked like a tail. Not only that, he also put his shoes on the wrong feet. It was so cute, and so Baby Plum at this point in time. His haircut is growing on me. I think because it's grown out just a little bit. Oh, and Little Elvis got an honorable mention for the storyboard/bookfair thing. His teacher wasn't sure why his medal had 2nd place on it. No biggie. As long as Little Elvis is happy. Baby Plum, Cheese Puff and I like our lazy mornings. The ones where we don't have to leave the house fully dressed when it's too cold and early for us. We get to enjoy these most Thursdays, and to a small extent on Tuesdays. Since it's so cold outside, I let them stay in their PJs most of the day. Baby Plum's wearing a new set of pajamas from my mom, with cool slipper socks that she also got him. Cheese Puff most likely peed out of his diaper onto his blanket sleeper, or was a messy breakfast eater. He's out of his pajamas. Most weeks, I make healthful muffins for Little Elvis' lunch. I try to find recipes with one fruit and one veggie (pumpkin, carrot or sweet potato) and wheat flour. Usually, I have to make 2 batches a week, because Baby Plum loves these muffins. He steals them and gets crumbles all over the floor. He's not sneaky about it, though. He shared some with Cheese Puff. Baby Plum's getting to where he doesn't like to share, so it's great when he's generous. Cheese Puff was a big fan. I believe these were chocolate banana muffins made with wheat flour. They didn't have any veggie, but they were really good. This is another day. When I was sick, I put a bottle of adult cough medicine in the diaper bag for me to take when needed. I then forgot about it... until it came open and spilled all over the diaper bag. I pulled everything out and washed the bag. Cheese Puff thought this was the best game ever. He threw the small diaper bag things around, and then dug into his container of puffs. This baby loves to feed himself. He's constantly frustrated with me feeding him these days. I think he's decided he's ready for table food. He loves feeding himself peas and very small cut soft carrots. He also loves to pull up on his big brother. Cheese Puff's pulling up on lots of barely stable things these days, and doing a decent job of it. We have a big board book that can be made into a Jeep type of vehicle. Baby Plum likes to drive it, and Cheese Puff did a good job pulling up on it the other day. Baby Plum also likes to feed Cheese Puff his puffs. He would put them on the lid one at a time. They are "fighting" a little bit these days, but they seem to really have a fun time together. Baby Plum likes to watch out for Cheese Puff. The big brother takes lots of stuff away from his baby, and tries to force other things on him. The other day I was in the kitchen, and Cheese Puff tried to crawl out of the playroom to visit me. Baby Plum wanted him to stay in the playroom, and kept saying, "No, Cheese Puff. Stay in the playroom!" I went out to see what was going on. Baby Plum had grabbed the foot of Cheese Puff's blanket sleeper, and was dragging his little brother back into the playroom. Cheese Puff was sliding backwards on his tummy, and looked confused, but wasn't upset about it. I thought it was funny, but did stop Baby Plum. I wish I had a picture, but I was worried the Cheese Puff might get hurt. On Friday, Baby Plum held up one of Little Elvis' Captain America action figures and said, "Captain America. This is Captain America, Cheese Puff. See? Captain America." I have had that Green Day song stuck in my head for about a week now. Why? Because Baby Plum and Little Elvis got to spend some of their Christmas money last weekend. Both spent more than they had, so hopefully Cheese Puff will get a chance to play with these toys when he's older, since he helped buy both of their toys. Baby Plum got this cool electric guitar and microphone set. To me, he looks like Billy Joe Armstrong from Green Day when he strums his guitar and sings into his microphone. He carried the set all over the house at first, serenading us in whatever room he found us in. He likes "Old McDonald" and "Jingle Bells." But I've been humming "Know your enemy?" and now poor Bob has it stuck in his head, too. But trust me, he looks just like Billy Joe when he's strumming away on his guitar and yelling into his microphone! Little Elvis bought a remote controlled moon that lights up their room at night. It can do all of the phases, although they both really like the full moon phase right now (more light.) He's into so much stuff right now. Astronomy, geography, superheroes, movies, just about anything. Little Elvis also loves the guitar and microphone set. At least, he would love them. But Baby Plum has decided that sharing is not for him anymore. Bob fixed my upside down picture issues. My mom sent me some super-cute photos, and although I fixed them in my computer, they went into Blogger upside down. I'm pretty sure it was operator error. Baby Plum's new profile. I'm finally used to his new look. He's very happy with it. Everyone tells me he looks like a little boy now, which makes me sad. I wasn't making my baby look like a girl. At least in my opinion, he didn't look like a girl. The director of his preschool told me yesterday that he had the sweetest little face. I think it's a lot easier to see his cuteness now that the blond curls are gone. Little Elvis got an Innotab 2 from my parents. It was what he really wanted for Christmas. Here he is showing Cheese Puff how to use it. That's sweet. But usually he's not as into sharing. But he and Baby Plum both LOVE Cheese Puff. The main fights these days are between my older two. Although, Cheese Puff does not appreciate it when Baby Plum takes "dangerous" toys away. Baby Plum is much more cautious than I am. I'm fine letting Cheese Puff play with a little play-dough container. It takes me 5 minutes to open those suckers with my nails. I seriously doubt Cheese Puff could open it. Baby Plum isn't so sure about that. This is how the boys celebrated New Year's Eve. See how they are all in green? That was not planned, but it looks like it was. I'll take it. Look at the shiny, pretty, curly hair. Sigh. These pictures were taken this weekend, before the weather dropped below freezing. It's been raining since Sunday, and really cold here. The boys miss our backyard. Cheese Puff really enjoyed his new bucket swing. Our old one (from Little Elvis' babyhood) deteriorated, and needed replacing. I like this one better. Obviously, sweet baby likes it. My bigger boys bouncing with Daddy. We've discovered that duck-duck-goose is really fun on the trampoline. I'm not invited for the "superhero" games. They were possibly playing superhero here. 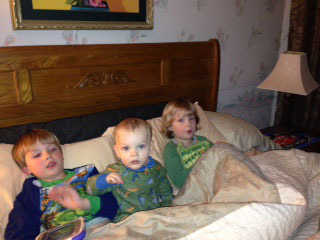 Our three sweet boys celebrating New Year's Eve with my parents. I felt a little better that evening, so we went out with friends. The day before, we took them to the zoo. Little Elvis and Baby Plum are posing with the reindeer, who were taking a much needed rest after their big trip on Christmas Eve. I have two other pictures, but for some reason, they are uploading upside down. They are right side up in my folder. I'm not sure how I did that. Little Elvis while I was looking at his schoolwork. I was trying to read what he'd written on a picture. He was in another room, but figured out what I was talking about. He said, "Oh that? I haven't copyrighted it yet. It's not ready." He copyrights most of what he does these days. No lie. He's already hip to protecting his intellectual property. He also writes letters, lots of letters. He's written to Baby Plum about leaving his stuff alone. He's written to Gram and Coachpa about driving safely. He's written to Captain America about how much he (Little Elvis) loves Captain America, his other toys, his parents and his brothers. He signs all of his letters with "Love, Little Elvis." Baby Plum has moments where he's just chatty. Last week, he got into the car after pre-school, and narrated our entire drive home. BP: "Yes! CBS! Are we going to go in there?" Me: "No. No good deals that I know of today." BP: "Yes. The Coca-Cola truck." Me: "Good eyes. I love Coke." BP: "Look Mommy!.... Look Mommy!... Look Mommy!!" I was driving, but I think he was pointing out various restaurants and random buildings. BP: "Yes. We can't go there. You don't have a coupon." Me: "That's right. I don't. We can't go there." I have never been to a Bonanza, so neither have my children. I don't even know if they do coupons. But Baby Plum knows his cheap mommy. I think it's funny that most of our car conversations revolve around food. Since that little trip, he's been obsessed with going to Chuck E. Cheese. That's all he talked about on Friday. We're going for Little Elvis' birthday. That day can't come soon enough for Baby Plum. Cheese Puff's on a roll. He's a very confident crawler at this point, and pulls up on anything and everything. He can crawl the length of our house -- usually while crying for me the entire time. He's into everything. He fell headfirst into the cat area last week, and still has a little bump to prove it. He's cutting 2 more top teeth. I still have issues getting close up shots of his pretty blue eyes, which are still blue! I talked to my aunt about this yesterday, and she said one of my cousin's eyes didn't change until he was in the first grade. We're not sure if there are blue eyes on Bob's side, or how far back you have to go to find them. For me, it's my grandfathers. So, his great-grandfathers. I love to watch him pull up on walls and doors. He's getting so good at this type of pulling up. And he wants to feed himself. I give him finger foods, but I think he'd like to feed himself his jarred foods as well. We've gotten him some of those little pouches, and he loves them! I do, too. He pretty much feeds himself, and it's not very messy. I'm a huge fan, and wish I'd discovered them with Little Elvis and Baby Plum. Cheese Puff is also waving. I have to get video, because he does the "pageant" wave. It's very cute. Not only is he waving, he's saying "dye-dye" while doing it. I'm not sure that he knows what bye-bye means, but he's happy to wave at people, and say "dye-dye." He also says what sounds like, "Hi" while waving sometimes. It's kind of shocking to be talking about him possibly talking at 10 months. Little Elvis didn't really try to talk until he was almost 2, and Baby Plum didn't start until he was closer to 2 and a half. It's late right now, and I'm just now getting online. He's having big problems with his teeth, so Bob is holding him while he sometimes looks at me and cries. Poor little Cheese Puff. So, normally I would be posting more. But I haven't felt up to it. I got sick on Christmas Eve, and then didn't really get better. It was much worse this weekend, but now I just have a sore throat. Why didn't I get better more quickly? This is how my 'nurses' healed me. They saw me lying down on the couch, covered in a blanket, with a stuffed animal for a pillow, and they pounced. Ok, so Little Elvis and Baby Plum pounced. Cheese Puff crawled up to me, pulled up on the couch, and demanded to join in the fun. They didn't let me have too much alone time. When I'm sick, that's what I want. They even had to come have conversations and use the bathroom (I am serious!) while I took hot baths. We're fairly certain I had the flu, and seeing how they liked to join me in my sickness, we are very lucky that everyone else has been symptom-free. With the beautiful blond curls? He was ready to look like his older brother. He's so, so proud of his cool new boy cut. Little Elvis says they're twins now. The night that he got his hair cut, he had bad nightmares and had to sleep with us. He's not sleeping super well. And he's been acting out. He refuses to listen anymore. Coincidence? I think not. My dad (aka the person behind this haircut) says I'm being silly.